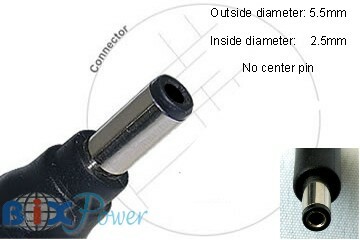 Different C series connectors have different sizes male plug, but all our "C" series connectors have same size 5.5 x 2.5mm female jack. They are designed to plug on a 5.5 x 2.5mm male barrel connector, such as our AC90 AC Charger, ED04 DC Car Charger, Z6 cable, and other product that has a 5.5x2.5mm male connector. They will convert the 5.5x2.5mm male connector to many different size connectors.